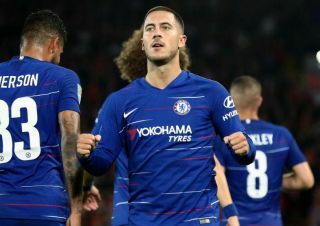 Eden Hazard became the first Premier League player since Arjen Robben all the way back in 2005 to bag an assist in three consecutive substitute appearances in the Blues’ 3-1 win against Crystal Palace this evening. The Belgian, who started the game on the bench, came on in the second half and made an immediate impact, as he set up Alvaro Morata from a free kick to assist the Spaniard’s second goal of the game. This was Hazard’s third consecutive time in which he had bagged an assist after coming off the bench, a feat that has seen him join a very select group of players to do so. Hazard joins both former Chelsea man Robben, and Tomasz Radzinski as the only players in Premier League history to achieve this feat, a unique and impressive accomplishment. Hazard has been one the best players on the planet since the end of the World Cup, so it’s not really a surprise to see him achieve this feat. Chelsea have really hit the ground running so far this season, something that is largely down the form the Belgian international has been in. And we’re sure both Sarri and Chelsea fans will be hoping the winger can keep up this form and drag Chelsea all the way in the title race this campaign. Moving away from the Premier League now, and you can catch AC Milan vs Udinese in Serie A action this evening LIVE by clicking THIS LINK here! Enjoy!